Amir Jajé is an Iraqi and lives in Cairo. After finishing his licentiate in Theology at the faculty of Babel, he completed a Master’s thesis in Theology in 2002 at the University of Strasbourg on the topic “The role of the Woman in the Eastern Church”. He then obtained a Master’s Degree in History of Religions from the Faculty of Catholic Theology in Strasbourg. His thesis was titled “The Image of the Virgin Mary in Islam”. In 2012, he completed a PhD in Oriental Studies (University of Strasbourg) on the subject “The Celebration of Ashura Among Iraqi Muslims Shiite”. He has been a member of the Pontifical Council for Interreligious Dialogue since 2012 and a founding member of the Iraqi Council for Interreligious Dialogue since 2013. From 2011 to 2014, brother Amir was Vicar Provincial of the Arab World for the Dominican Province of France. He was Prior of the Dominican community in Baghdad (2010-2013), and from 2012-2015 he was the director of the Baghdad Academy for Human Sciences. 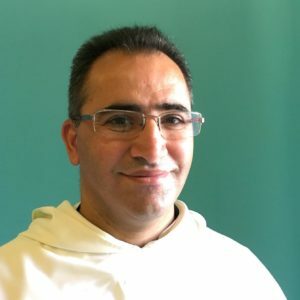 He taught in the faculty of Theology and Philosophy of Babel College in Baghdad (2004-2015), the Catholic Institute for Theology in Baghdad (2011-2015) and the Dominican Online University (DOMUNI). He translated Mahmoud Ayoub’s book, Redemptive Suffering in Islām: A Study of the Devotional Aspects of ‘Āshūrā’ in Twelver Shi’ism, 2013. He published his own book, “Women in the Syriac Church,” in 2016.